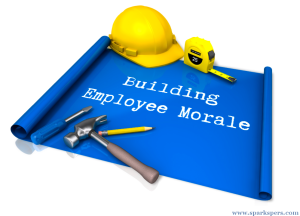 Whether you are in the brick-and-mortar world or focusing on an online business only, the realities of employee morale never goes away. No amount to marketing strategy and inventory management can override the reality of employee motivation when it comes to sales success. An online entrepreneur will do well to remember that it is best to take a head-on approach to issues of employee unhappiness. Side-stepping it or ignoring it will only make it blossom into bigger problems. What are some of the common signs of employee unhappiness? Poor commitment to work and unwillingness to contribute are big indicators of employee dissatisfaction and this can be seen in things like people not showing up at the right time or frequent sick days. Extreme clock-watching and disconnectedness among employees can also suggest that employee morale is low. We see that these are signs that have a direct impact on the bottom line as every individual performance can contribute to the organization’s success. If one happy employee carries the work-load of another unhappy employee, this will not be a long-term solution. The strain will eventually lead to two unhappy employees. There is a cost to every organization when there are unhappy employees, whether it is apparent in the short-term or not. The financial commitment involved in recruiting and training each employee is a significant investment and it is necessary to address employees’ unhappiness to make sure the investment pays off. Poor performance and employee turnover can cause significant losses and is not conducive to building a successful business. Employees who feel over-managed tend to feel powerless. Do you constantly ask your employees about the progress of a particular task? Do you follow-up on emails every hour? Do they have any authority to make decisions? Good management is about empowering your team members by allowing them to be independent. Giving employees the feeling that they are fully responsible for their own actions/decisions, you can motivate them to be more invested in their work. Employees who feel valued and trusted are happy employees. Communication is the key to harmony everywhere, including workplaces. An organization that does not have a smooth flow of information can be a demoralizing place to work. There are some deep implications when members of the organization prefer to keep information to themselves, instead of sharing it with each other. If people withhold information to hold power, there is every likelihood that the team is not working well together. If people are unclear about where to go for information, that is a sign of a poorly managed project. A good business owner has to make sure the information channels within the company and with vendors, clients and consumers is professional and clear. This is a key component of a happy workplace. This is a central principle for every manager to remember in this day and age. Whether it is for yourself or your employees be alert to not creating the imbalance. A workplace where there are unstated expectations of long hours and weekend commitments may work well in for short stretches to pull through a deadline or something; however, making it a habit is dangerous and it is disrespectful of employee time. To expect people’s lives to revolve around their work is seen as an outdated approach and for good reason. Those employees who have a good work-life balance are seen to have time to recharge their batteries. They are more motivated and more productive. Ensuring that regular hours and vacation times are honored makes for a happier workforce. As an entrepreneur you can understand the excitement of having new challenges. Employees, who don’t go the entrepreneurial route, also like to feel they are learning and growing in their jobs. Limited opportunities for growth and feeling boxed into a repetitive job can be very destructive for motivation. It is important to create a work environment, a structure, that allows each employee to see a path forward. If it is not a climb up a ladder, it should at least be a sense of increasing responsibility. It is important to pair this with economic rewards also as otherwise it will be seen to be a meaningless gesture. As a business owner, you cannot underestimate the importance of a happy employee. Whether you have one employee or several, make it a point to keep in touch with the emotional reality of your team. While there may be extreme cases with irrational demands and constant unhappiness, by and large what employees want may well align with the best interests of the business. A happy employee and a successful business can be interlinked goals for you. Treat your employees with respect because the truth is that people are excited to go to work when their contributions are given value and they know they are an important part of the company.